By the time that our students get to sixth-grade (we are an unusual school district in that we have k-6 schools), our students have heard a lot about boxes and bullets. They develop opinion essays with boxes and bullets. Information pieces? Boxes and bullets. They even take notes on their nonfiction reading with boxes and bullets, among other strategies. Therefore, some of these students are a little over-boxed and bulleted by the spring of sixth-grade. In response to this, Peg Bruno, one of our sixth-grade teachers, let the students try out illustrated boxes and bullets for the literary essays that they would be writing. When she shared these posters with me, I immediately asked her if I could blog about this idea. She started by sharing a sample poster that she had created about Freak the Mighty. At the center of the poster, Peg boxed out her claim, one of the main themes of the book. 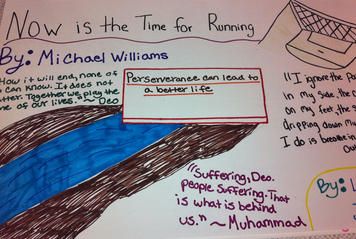 From there, she found quotes that supported this theme, and drew pictures that went along with it, as well. The students took off with this idea and worked in partnerships to create their own posters of books that they have read. 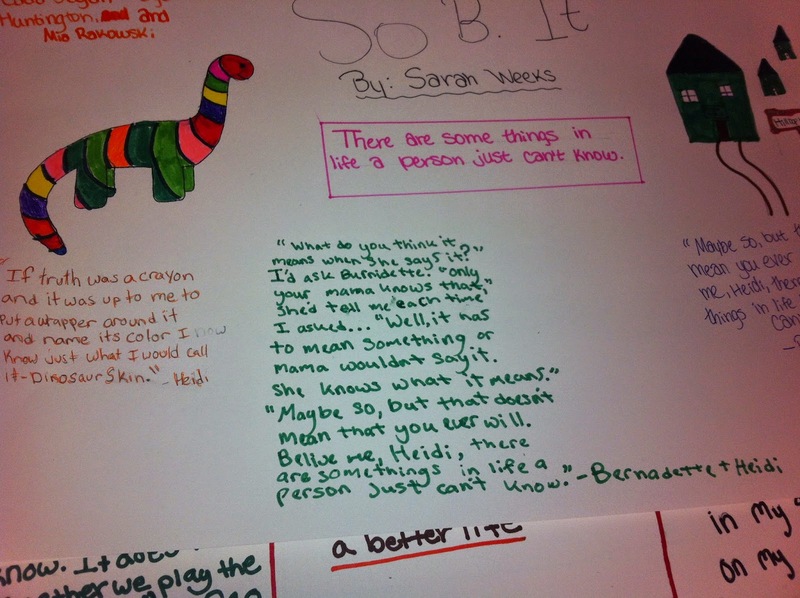 While I know that many of these students would have culled their books for great quotes, even if they were developing a plan in their notebooks, the poster really inspired them to make sure that the quotes were "perfect." I also loved that students were creating the visuals that helped them remember, connect, and even think more deeply about the books that they read. As you can imagine, the students wrote their essays, using their chosen theme, as well as the quotes that they included in their posters to illustrate their themes. They talked about the books as they drew, providing reasons for the pictures that they drew, and organically continuing the conversations that they had about their books. Talking is an important precursor to writing, so the more opportunities that we can provide students to have meaningful conversations, the better. And in an academic world that does not always prioritize art, I love finding ways to weave art into other subjects. Having been on vacation last week, I had some good reading time and I finished The Berlin Boxing Club by Robert Sharenow. Karl Stern is a Jewish teenager as Adolf Hitler rises to power in Germany. Skinny and awkward, he is an unlikely boxing protegee, but, through circumstances and coincidences, he receives professional training from the national boxing hero, Max Schmeling. Max Schmeling, according to wikipedia, may have risked his life to save two Jewish children, and Karl is one of the fictionalized children. The bullying scenes in this book are still vivid in my mind, and kept me tense and angry as I read. The impending horror that my 20-20 hindsight allowed me made it that much harder to read this book, since I wanted to jump into the pages and tell Karl and his family to get out of Germany while they could. The bullying becomes more and more brutal and Robert Sharenow presents it graphically. I would not recommend it to elementary students, and even with middle schoolers, be prepared to explain circumcision and be ready to engage in some upsetting conversations about the Holocaust. Given what is going on in Ukraine, there are important similarities and connections that we should all be paying attention to. Jewish people are being asked to register there in ways that are strikingly reminiscent of Nazi Germany. Karl Stern is an inspiring main character, and there are many examples of his perseverance, resilience, kindness, and loyalty. Written from his perspective, he is honest and reflective as he tries to make sense of a changing world. He is an artist and fills the pages with cartoon characters, who entertain but also give hope to both him and his sister. His father is an art dealer, and as his business plummets, he works hard to save treasures of art. I was fascinated to read about how some of the art was smuggled and stolen as the anti-Semitism increased. Overall, this book was gripping, meaningful, relevant, and educational. For any students who are ready for it, I highly recommend it. Lighter reading for the week included a re-reading of The Heart of Nonfiction by Georgia Heard. I wrote all about this incredible book here. Suffice it to say that I love this book. I also brought along the current issue of Educational Leadership, which is focused on writing. Although many of the articles seemed to be directed at secondary instruction more than primary instruction, there were several that got me thinking hard, even on the beach. Mary Ehrenworth's article is full of practical ideas for involving parents in children's writing and Kelly Gallagher affirms the importance of powerful writing as a life skill, and the power of mentor texts. The example he gives of two portrayals of his father's death won't leave me any time soon. I am percolating a post about the five-paragraph essay and its place in elementary classrooms after reading Kimberly Hill Campbell's piece. All in all, this is a great issue for anyone involved in writing instruction! Finding the Heart of Nonfiction--Such a Powerful Book! I have been meaning to write a post about Finding the Heart of Nonfiction by Georgia Heard for a few months, but a couple of issues have gotten in my way. First, I want to really do her work justice as it is one of the most useful books for writing instruction that I have ever read, but second, and more importantly, I have loaned it to several teachers over this time and their feedback has been so positive and so grateful that I have not wanted to ask for its return. One teacher, whose student just won a state contest for her entry on nonfiction, said, "this book changed my teaching life." Georgia Heard spends the first part of the book really breaking down what a mentor text is and what is involved to use mentor texts meaningfully in the classroom. Regardless of whether we are talking about fiction or nonfiction genres, she writes about what mentor texts are, why to use them, how to choose them, and then how to use them with students. 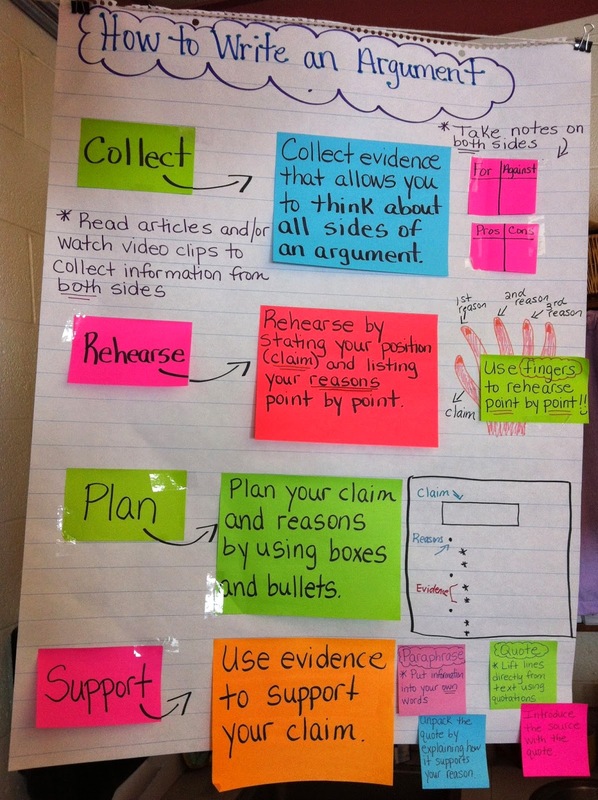 She offers suggestions for mini-lessons, inquiry lessons, and even provides note-taking templates, as well as several examples of student work and evidence of student learning. I was truly hooked by this book on pp 22-23 where there is a Try This exercise, suggesting the use of different lenses to read two different texts about seahorses. One is a wiki.answers entry and one is from Sea Horse: The Shyest Fish in the Sea by Chris Butterworth. Both of these texts give important information about seahorses, but the latter is full of figurative language, imagery, and precise words. What an incredible lesson for teaching students the value of beautiful words, even--no especially!--in nonfiction! In the second part of the book, Georgia Heard provides a chapter for each of seven nonfiction craft tools: focus, turning facts into scenes, leads, points of view and voice, precise language, text structures, and endings. Since I have read this book, I have had opportunities to develop some units and to coach teachers and students to use some of the strategies in this chapter and trust me, they are effective! FOCUS: She uses the analogy of the hearth because it is "a place in a home where family and friends come together to warm and comfort themselves. If we think of focus in writing in the same way--the hearth of a piece of writing around which all the details and words gather--it's a helpful metaphor. " (p. 41) LOVE THIS! Specific, creative strategies follow to help young writers focus topics with suggestions for mentor texts, teaching ideas, and writing tips. 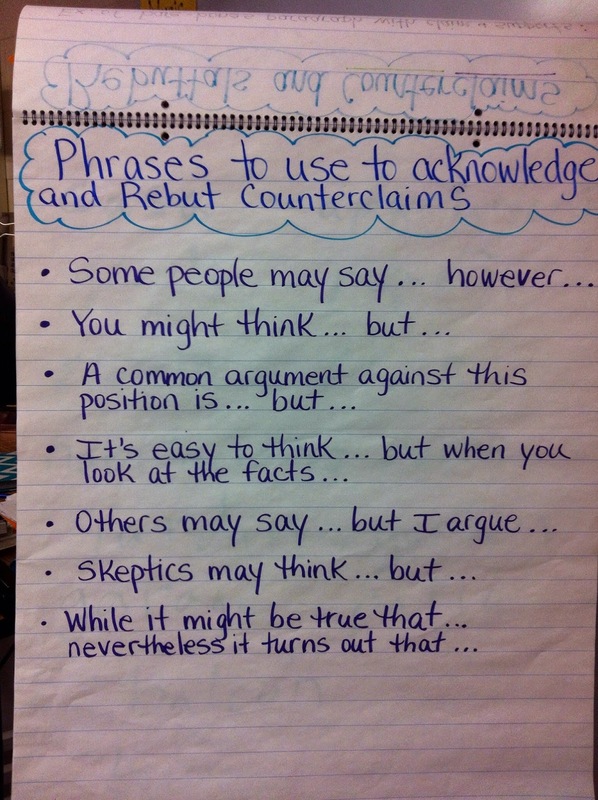 I especially love the idea of helping students to focus their nonfiction writing by developing a poem about it. Because poetry does not explicitly have a place in the Common Core States Standards, I am always looking for ways to weave it into units and what a meaningful strategy! TURNING FACTS TO SCENES: One of the most memorable parts of this book for me is on pp. 52-53 where there is an excerpt about tarantulas from Jean Craighead George that is packed full of not only knowledge and facts about these spiders, but also of description, narrative techniques, figurative language and precise words. 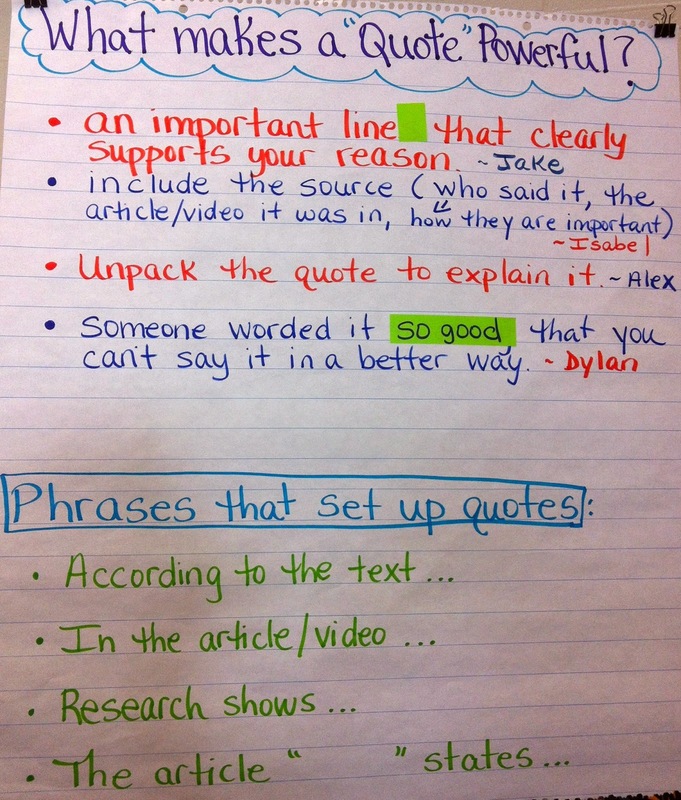 Because Georgia Heard gives exercises for more and less experienced writers, there are choices for teachers to use as examples with students to give them practice in turning facts into Jean Craighead George-like texts. Like poetry, voice does not explicitly live within the words of the CCSS, but descriptive language does! And this chapter visibly demonstrates the progression of good writing to great writing. LEADS: I love teaching leads, since this is the quickest way to hook or lose readers, and the tips, ideas for charts, examples and exercises found here are inspiring. We used some of the ideas in our fourth-grade informational writing unit and our students loved having a repertoire of leads. 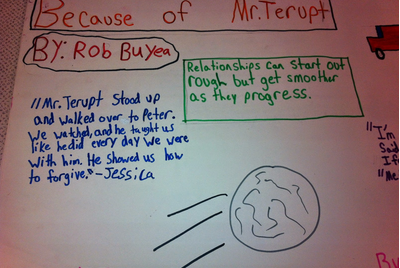 We developed charts that presented the information on p. 61. 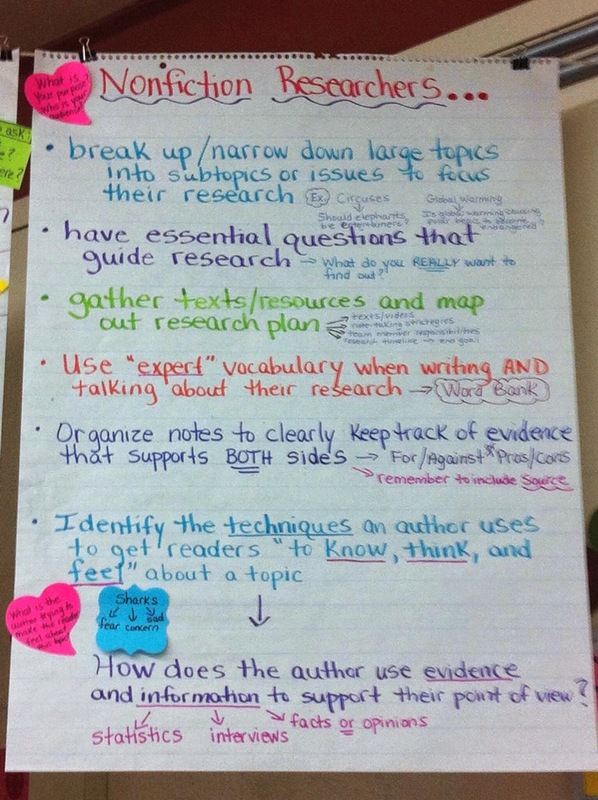 Now, as students are moving into their research-based essay unit, they are transferring their knowledge about leads! POINT OF VIEW AND VOICE: This chapter is seven pages long and the pages have plenty of white space, but there are SO MANY ideas and SO MUCH knowledge to present students. Students should understand the differences between first person, second person, third-person objective, and third-person omniscient. 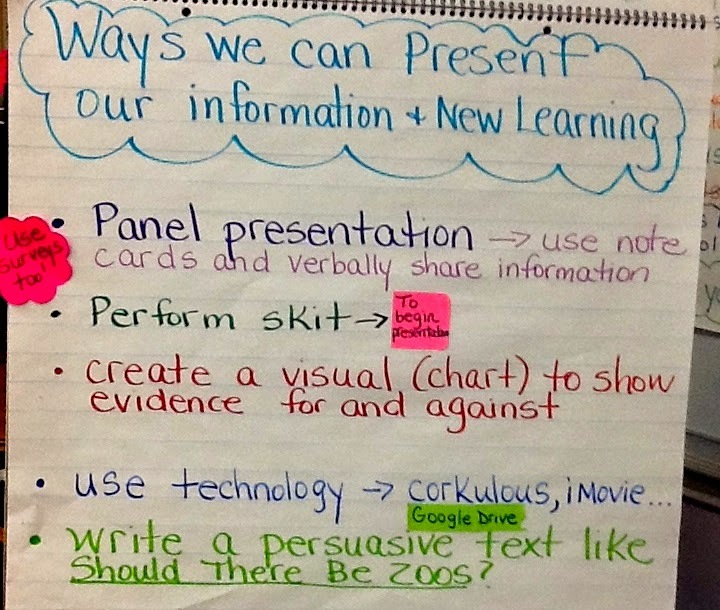 There are suggestions of how to present this information and then for how to inspire students to try out different techniques within their own writing. Our students really enjoyed writing letters from the perspectives of different famous people in their information books, a lesson that was inspired from these pages. When we think about the importance of writers understanding audience, these are powerful pages. PRECISE LANGUAGE: As I stated earlier in this post, voice does not explicitly live within the CCSS, but when writers use sensory words, precise nouns and verbs, figurative language, and domain-specific vocabulary, voice emerges. One of the exercises in this chapter is to guess whether there are more concrete nouns, active verbs, or adjectives in a given passage. If you want an engaging activity to use to help students understand the power of nouns and verbs, as opposed to juicy adjectives, check out p. 81! I also love that Georgia Heard presents lists of words to avoid: things, stuff, beauty, niceness, glory, devotion. The chapter about precise language is the longest of the seven chapters, and I'm not going into all of the details of it. Suffice it to say that there are several lessons, strategies, exercises, student samples, writing tips, and even games that jump off these pages and would help any level teacher provide engaging instruction about language and the importance of words. 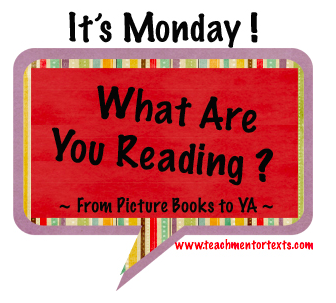 TEXT STRUCTURES: I have thought of text structures as a relative strength in our curriculum, but I still found plenty to learn in this chapter. Again, there is a framework that wants to jump out of the book and on to a chart for student use in the classroom. There are also strong and clear links to the CCSS for both readers and writers, since the Standards emphasize that students study and learn about craft and structure. ENDINGS: I see a lot of endings that go something like: "That's my book about...I hope you liked it." Do these endings give the sense of closure that the CCSS require? I'm not sure, but they definitely don't give me the sense of closure that I want! 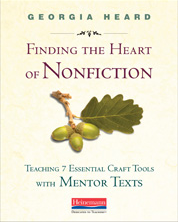 Finding the Heart of Nonfiction includes specific strategies for getting students to develop endings that are more satisfying--circular endings, question endings, chronological, quotation, and reflective endings... There are descriptions, strategies, examples, and reproducibles for of all of them. Without the bibliography and index, Finding the Heart of Nonfiction is 123 pages long. The font is average and there is plenty of white space on many of the pages. However, it changed the way I think about the instruction of any sort of nonfiction writing. I know that my post is longer than usual, but I hope that it has inspires you to find yourself a copy. 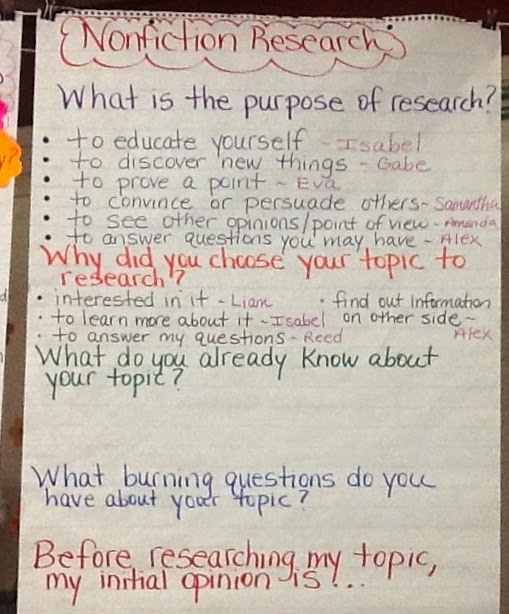 Last week, we completed our Nonfiction Research Unit and Research Based Argument Essay Unit, which are integrated units in reading and writing workshops. Below are the charts we created as a class during the unit. I tried to put the charts in the order (somewhat) that we created them in to help give you a snapshot of what our work looked like in our classroom. 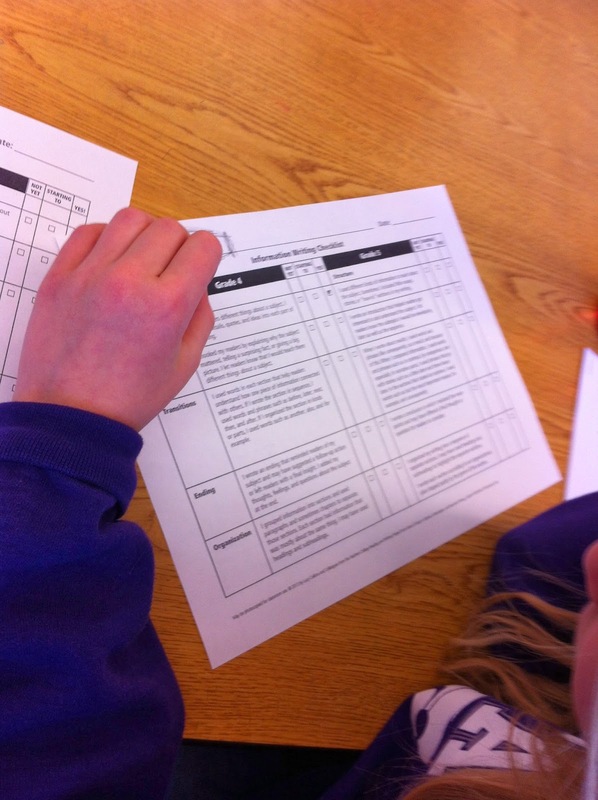 During each reading and writing unit, we create class charts that identify the teaching points taught in each mini-lesson so students can refer to the charts throughout the unit. Below you will see various teaching point charts that students constantly referred to while working independently. These charts are the footprints of my mini-lessons and our learning together during the units. At the beginning of a new writing unit, I always launch the unit with an inquiry lesson where students immerse themselves in a mentor piece of writing to identify the characteristics/qualities of the type of writing. 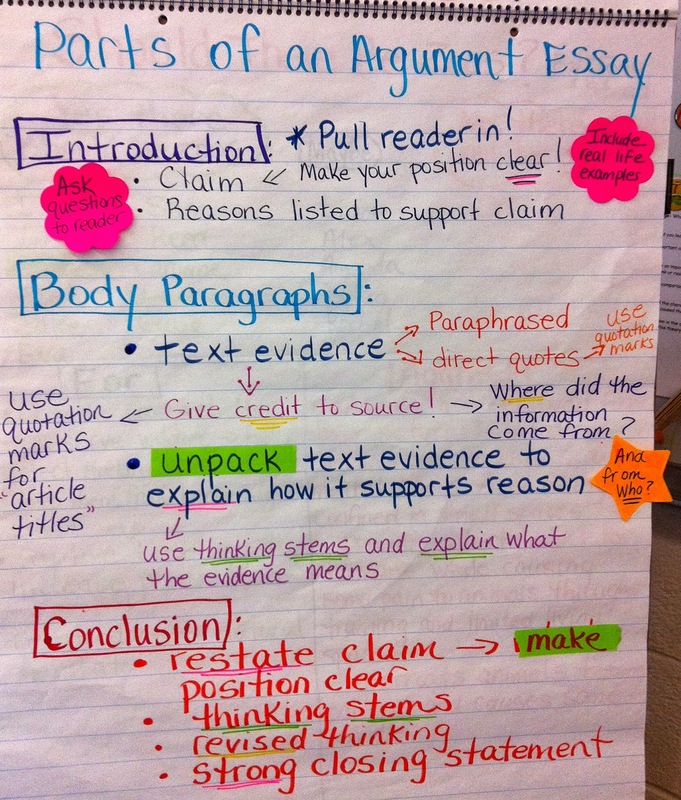 Below is a chart we created after reading 1-2 argument essays that lists the parts of an argument essay. 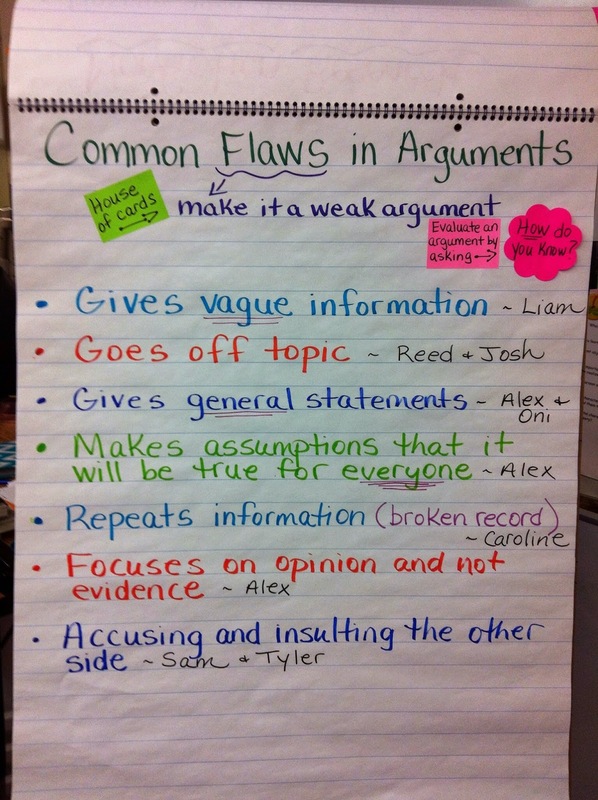 We created this chart together and continued to add to it throughout the unit as we read more examples of argument essays and as we began to write argument essays ourselves. 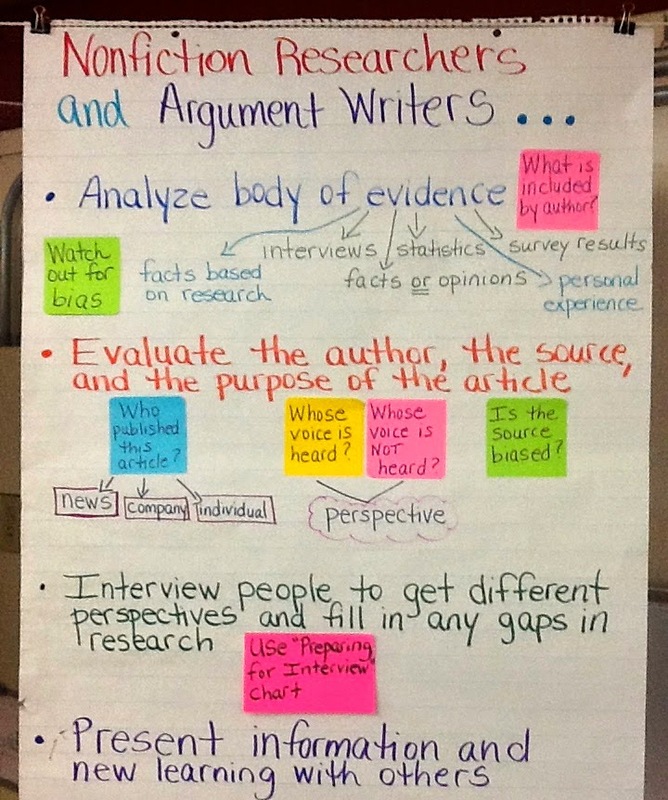 The chart to the right is a "How to" chart that visually teaches and reminds students of the steps to writing an augment essay. At the end of each unit, we have a class celebration that culminates the work students did as readers and writers. Students always have a voice and a choice in how we celebrate and share the work they did during a unit so at the end of this integrated unit, they brainstormed ways they could present their new learning with their classmates. Below is the chart where I jotted down the ideas they shared out after they met with their research groups to brainstorm ways they can share what they learned from their research. Each research group ended up choosing a different way to present their research and opinions which was great! One group used the Corkulous app I have on my iPad, while other groups performed skits, verbally presented both sides in a panel presentation, and used Google Drive. 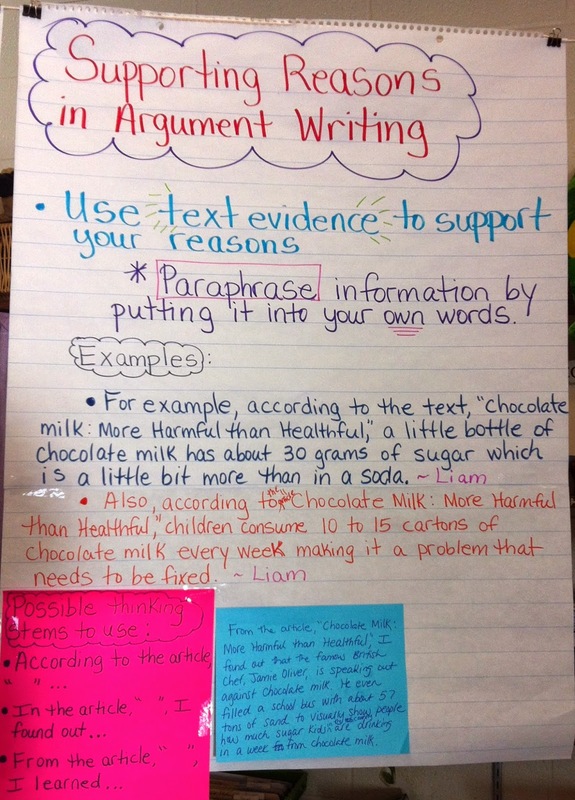 In addition to this type of sharing, we also had a writing gallery to share their research based argument essays. For the gallery, students created a comment sheet to put next to their argument essay so their classmates can leave comments after reading their essay. Once students had their essay and comment sheet side by side on their table, students began the gallery walk by sitting down to read essays their classmates wrote and leave them positive comments. After the gallery walk, students return back to their seat to read the comments their classmates wrote on their sheet. To culminate the gallery celebration, I ask if anyone would like to honor someone for their writing. Students take turns to verbally honor one another for something they admire that they did as a writer. Vacation started on Friday, and I am looking forward to a good week of reading. I finished A Snicker of Magic by Natalie Lloyd with Cecily, my youngest daughter. We read this one out loud and it took a lot of self-restraint on my part to not read ahead! What a wonderful collection of characters in that story, and what a positive feeling this book left with us. One of favorite aspects of A Snicker of Magic was the anonymous gestures of kindness that Jonah, one of the main characters, made sure occurred throughout the story. He paid attention to people's needs and then left them what could help them. Cecily has been inspired to be a bit of a "Biddle" (read the book), and that has been joyful to watch! One of the teachers had left a copy of Eleanor and Park by Rainbow Rowell on my desk, with a post it on it, saying just that she had loved it. I had seen this title on some of the blogs that I fillow, but I really had not paid attention to it, so I was surprised when I started it and realized that it is very much a book for teenagers; I don’t think my sixth-grader would understand or enjoy most of this book. However, I am looking forward to talking about it with my high school daughters. Eleanor arrives at a new school, moving back with her mother, abusive husband, and siblings after sleeping on the couch of a family friend for several months. Her living situation is dismal and the she faces cruelty on all fronts, but Park befriends her and their relationship grows. 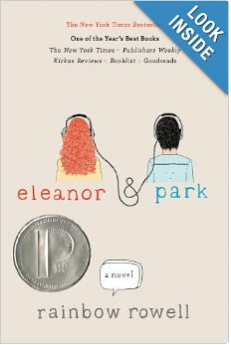 As readers, I sometimes felt like we were just ahead of Park in getting to know the secrets and complexities of Eleanor, and I admired that craft. At several times, I wanted to jump into that text and tell her to just trust him, to just tell him of all that is going on, because I wanted them to make it, despite the incredible odds their relationship faced. Through telling the story from both characters' perspectives, Rainbow Rowell brought us into the worlds and the minds and the hearts of Eleanor and Park. I loved both of them. I miss both of them. And I am still cheering for them. I have some professional books in my bag and I have to see what books my girls packed, as I was not expecting to finish Eleanor and Park on the plane. No vacation is complete without a trip to the book store! March Madness Book Edition 2014: Final Voting Results! 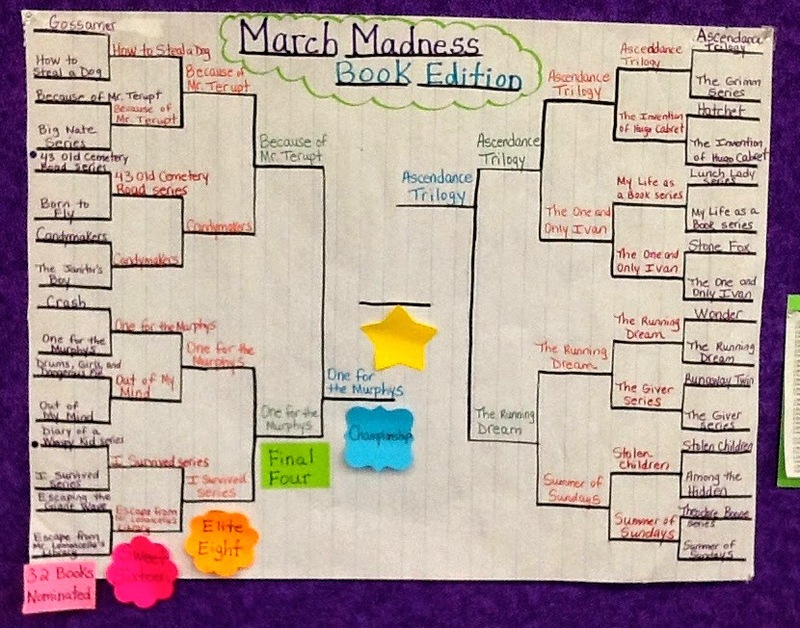 In the month of March, my class participated in March Madness: Book Edition - click here to read my posts about the process of creating the brackets and voting. This week, my students voted between The Ascendance Trilogy by Jennifer Nielsen and One for the Murphys by Lynda Mullaly Hunt to see which one would be the champion for this year. For those of you that followed our March Madness last year, you know that these were the SAME two titles in our Championship round last year and there was a tie so we had two winners! If you have read these books, you understand why the students struggled voting last year and this year! Some students (myself included!) even opted out of voting because they couldn't make a decision between the two! I love both equally and personally would not be able to vote between the two, so I immediately understood how my students felt when it came down to circle only one on the ballot! 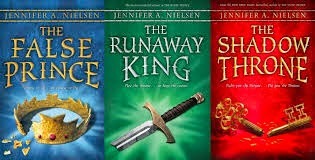 After tallying up the votes this week and re-counting them, the Ascendance Trilogy by Jennifer Nielsen won by two votes! Congratulations to both Jennifer Nielsen and Lynda Mullaly Hunt for writing these fabulous books and bringing them into our lives as readers! Thank you! We have been working hard to create more variety of genres in our writing instruction. Up until this year, our fourth-grade curriculum emphasized narrative writing, with no explicit instruction in informational writing. 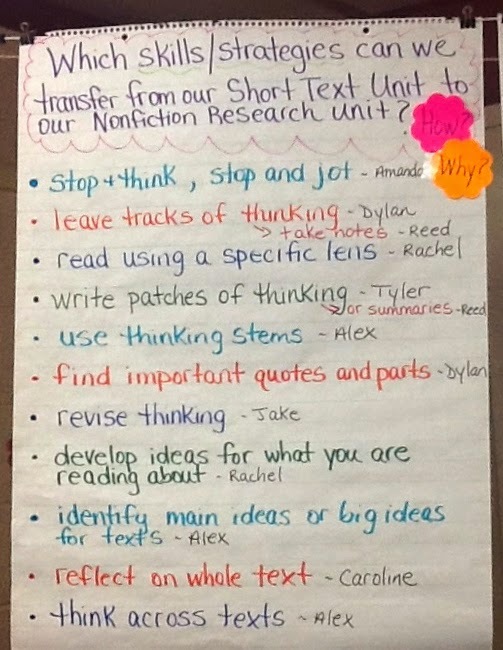 This year, two of the schools agreed to pilot an informational unit that we adapted from the new Units of Study from Teachers College Reading and Writing Project. Anna Gratz Cockerille authored the Grade 4 unit, The Art of Informational Writing. Although her book used the Revolutionary War time period as the content for students to write about, we found that our Connecticut history unit worked well--students just need content to write about. Teachers referred the students back to these charts over and over throughout the unit, constantly using these charts to build independence. For some of the students, we even had smaller versions of these charts made so that they could keep them right in their notebooks for quick reference tools. We decided as a team that we would limit the students' choice for their first book to be about a specific set of topics that had to do with Connecticut. Even though we recognize the value of choice, we wanted to make sure that, for the first book, students knew most of the content so that they could focus more on the structure of information writing. One of the teachers created this chart with the students, and it is a chart that could be modified to fit any history topic that classes are studying. The students loved working on these books, and created several different pages with various text features that included introductions, timelines, fun facts, glossaries, and conclusions. However, the emphasis was on the writing, and even some of the most resistant writers found that they had a lot to write about during this unit. For the second book, we decided to give students a choice of famous people who had impacted Connecticut. Together, we generated a long list of people whom they had already studied. 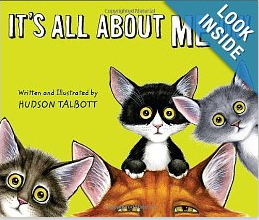 Then, we read them the book, It's All About Me-ow by Hudson Talbott. Even though this book is not about a famous person (unless you are a cat), we found that it provided incredible inspiration to our writers about what they could include in an informational book about a person. 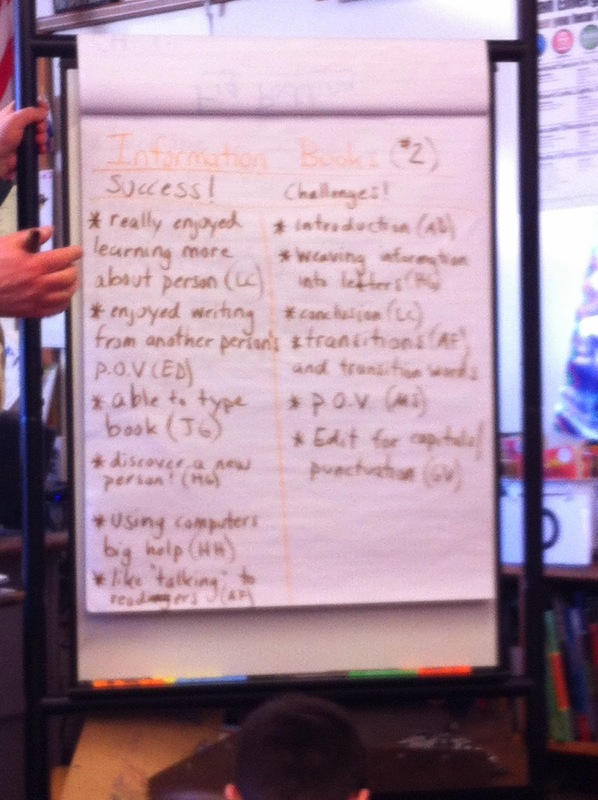 Some of the ideas that the students had about what could go in this second book helped to create the Information Book #2 chart. Today, our students celebrated their second books, using checklists to reflect on what they have learned and what they can set as goals. They also provided us wonderful feedback about what they liked and what they would recommend that we'd do differently. Overall, this was a wonderful unit. The students were excited, engaged, and produced incredible products. I highly recommend the new Units of Study, as they are inspirational, with layers and layers of teaching points, coaching ideas, and insights about young writers and how to teach them. I am sure that most kindergarten teachers reading this blog will already know Howard B. Wigglebottom, but I happily met him last week. Our kindergarten teachers have been asking for more resources for their citizenship unit that they teach in social studies. Howard Wigglebottom is a lovable rabbit who I came across when i was searching for literature that teaches about courage, friendship, empathy, and respect. 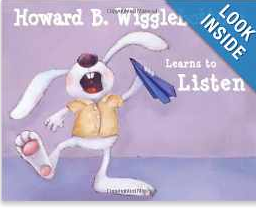 Our library had Howard B. Wigglebottom Learns to Listen, written by Howard Binkow and illustrated by Susan Cornelison, so this was the first one I read. I laughed out loud. The pictures are hilarious, offering many opportunities for inferences and discussions, but, more importantly, the messages were crystal clear and developmentally appropriate for young children, as well as some of the older sets because of the humor. Howard Binkow also includes questions for discussions and websites for additional information about listening. In our citizenship unit, we emphasize traits of citizenship and I have placed an order for some of Howard's other books, including Howard B. Wigglebottom Learns About Courage and Howard B. Wigglebottom and the Monkey on his Back--a Tale About Telling the Truth. Thanks to many of my IMWAYR for the recommendation of Manfish by Jennifer Berne and illustrated by Eric Puybaret. 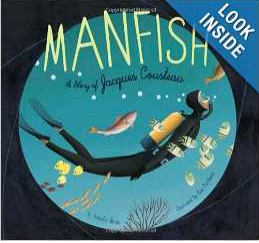 Manfish is the inspiring story of Jacques Cousteau and it is a wonderful mentor text for informational writing. For example, when Jennifer Berne describes Cousteau's first experience of seeing the underwater world with a pair of goggles, she writes, "Beneath the water, her was surrounded by silvery green forests of sea plants and fish he had never seen before. Everything was silent and shimmering. It was a whole new world." The story continues with beautiful images of the underwater world and ends with a charge to readers to discover, care for, and love the worlds that he explored. Don't miss this book as it is an incredible example of a beautifully written biography. 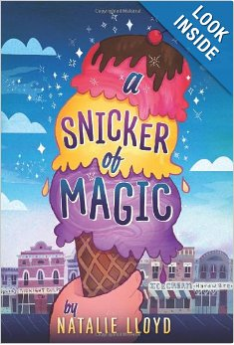 I am savoring A Snicker of Magic by Natalie Lloyd, as I have been reading this one out loud with my sixth-grade daughter, Cecily. It's taking a great deal of self-restraint on my part to not read ahead and find out all of the wonderful inter-connectedness and mysteries of the characters, but NCAA basketball has been incredibly distracting for us here in Connecticut. Happy reading, and GO UCONN! March Madness Book Edition 2014: Championship Round! This month, my class is participating in our very own March Madness Book Edition! Click here to read the posts I wrote this year and last year about how this idea came to action in our classroom and how we got started. Last week, the students voted which two books would be in the championship round. 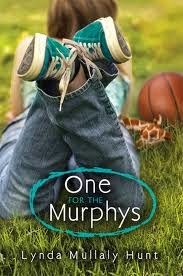 The Ascendance Trilogy by Jennifer Nielsen and One for the Murphys by Lynda Mullaly Hunt were the selected books! These were the same two that were chosen last year for our Championship round! That shows how much kids love these books! As soon as I announced the championship round results, the reaction from students was, "No!! How are we going to choose between those??" Last year, the reaction from students was the same and it ended up being a tie when we voted for the winner so I will not be surprised if the same happens this year. Either way, I know it will be very close! We will vote on April 7th so stay tuned! !